Plans for the multi-million pound regeneration of the Tamar Valley will be unveiled to the public for the first time on Tuesday. The Tamar Valley Area of Outstanding Natural Beauty Service is bidding for more than £7m to spend on conserving and enhancing the area. The Tamar Valley regeneration work has been split into two main schemes. 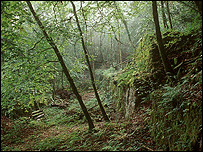 The first, the Tamar Mines Heritage Project, has bid for £5.2m from several bodies including the Heritage Lottery Fund and the South West Regional Development Agency. The money would be spent on conserving four flagship mine sites and the construction of a new bridge over the Tamar for walkers. The second scheme, the East Cornwall Regeneration project, would see £2.1m invested in safeguarding and stimulating the local economy by conserving the area's industrial heritage . Tamar Valley AONB Service Manager, Tim Selman, said: "So far the projects have taken four years to get this far, a reflection of the complex nature of big funding bids. "But so far over £4m has been either promised or secured and we are finishing bids for the rest. "We remain optimistic about starting the work over the next year." "They are a major economic reinvestment in the landscape, environment and heritage of the area." The plans are being exhibited at Gulworthy Village Hall this weekend.